The Perseid meteor shower is due to reach its annual peak on August 12. Perseid activity can be seen from around the third week of July through to the third week of August, producing a few meteors per hour for most of this period. Rates start to pick up significantly however a few days ahead of the August 12 peak. The peak itself is predicted for Aug 12d19h UT, which means that the best observed rates are likely to be seen during the night of Aug 12-13 (Sat-Sun). Activity will be visible throughout the night but observed rates are likely to be at their best late in the night when the radiant is highest in the sky. 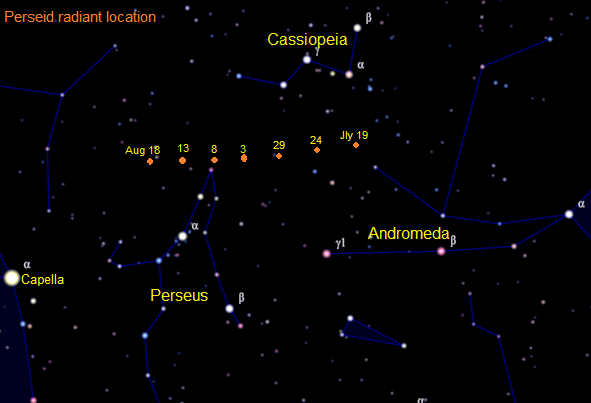 This chart shows the location of the Perseid radiant. Note that it moves from night to night. As always, do not look directly at the Perseus area as any Perseids that appear in that part of the sky will be almost head-on and so will be difficult to spot – because their paths against the star background will be very short. It is better to observe an area of sky around 30-40 degrees away from the radiant and about 50 degrees above the horizon, as Perseid meteors seen there will have longer paths against the star background. The Perseids are rich in bright meteors (relative to the sporadic background) and around a third of Perseids leave persistent trains. Moonlight circumstances for the 2017 Perseid peak are not helpful. Observations of the rise to maximum will be hindered by the Full Moon of August 7 and the Moon will be annoyingly slow to move out of the evening sky in the nights which follow, especially for observers at the latitude of the UK. The problem gets worse the further north you are. On the night of maximum, the gap between the end of nautical twilight (Sun 12 degrees below the horizon) and moonrise is only around 50 minutes from the latitude of London, shrinking to 33 minutes from Manchester and a mere 11 minutes from Edinburgh. Moreover, in the nights following Full Moon, the Moon moves closer to the Perseid radiant and will now be located in Pisces. Often, it is suggested that the Cygnus-Pegasus area is a good area of sky for visual observers to monitor but, with the gibbous Moon located to the lower left of Pegasus, this will be an unsuitable area to observe in 2017. The area of sky around Polaris may prove better. In any case, the most important factor is to keep the Moon out of your field of view and, if possible, observe in the shade, so as to minimise the glare from nearby reflected light. The brighter sky background will mean that the exposure times for DSLR imaging will need to be kept short. Video cameras tend to cope better with moonlight and can even record fireballs close to the Moon in the sky. Once again, though, the brighter sky background will reduce the overall number of meteors recorded. Unfortunately, as often tends to be the case nowadays, there are stories being circulated on-line that give a very misleading impression as to what to expect from the 2017 Perseids. – it is not your last chance to see the Perseids for 96 years. The Perseids do, of course, produce a good display every year. The 2017 display, due to the moonlight, will actually not be as impressive as that of 2016 – but is certainly still worth watching. It is true that the sky background will be brighter this year – but that will be due to the moonlight rather than the Perseids themselves (unless you are lucky and the sky is lit up by a particularly bright Perseid fireball!). In years with a moon-free Perseid maximum, the observed rates from a reasonably dark observing site may reach 30 meteors per hour late in the night, having been only around 12 per hour early in the night. In the moonlit skies of the 2017 maximum, these figures may well be halved … but these are still pretty impressive rates.